Dolphins do not hibernate and could not hibernate under water, because they need to breathe at least every 30 minutes and must rise to the surface to do so. Dolphins also do not migrate as a measurable group with a definitive pattern, but researchers find that many dolphins do move seasonally. Dolphins cannot hibernate because they do not have involuntary breathing respiratory systems like humans and other animals do. Thus, they must be conscious to breathe. Only half of a dolphin's brain sleeps at a time, as evidenced by electroencephalograms obtained by researchers. They do this type of sleeping on and off for a total of about 8 hours a day. Dolphins can stay underwater for about 30 minutes and then need to rise to the surface to breathe through the blowhole. Sometimes they sleep in relatively deep water and rise at least every half hour, or they sleep in shallow water and rise more often. Another way they sleep is to rest at the surface with the blowhole above the water, or to swim very slowly in pairs while staying in this semi-conscious state. In all these types of sleep, dolphins keep one eye open, and it does not always coordinate with which half of their brain is at rest. When sleeping dolphins swim in pairs, however, the open eye of each is directed at the other dolphin. Dolphins do not migrate in significantly large numbers in regular definitive patterns. Some do move seasonally, however, although usually not in the great lengths we see in animals such as geese and other birds. In latitudes with more extremes in winter weather, such as the North Atlantic coast of the United States, more dolphins are found in the southern waters during winter. 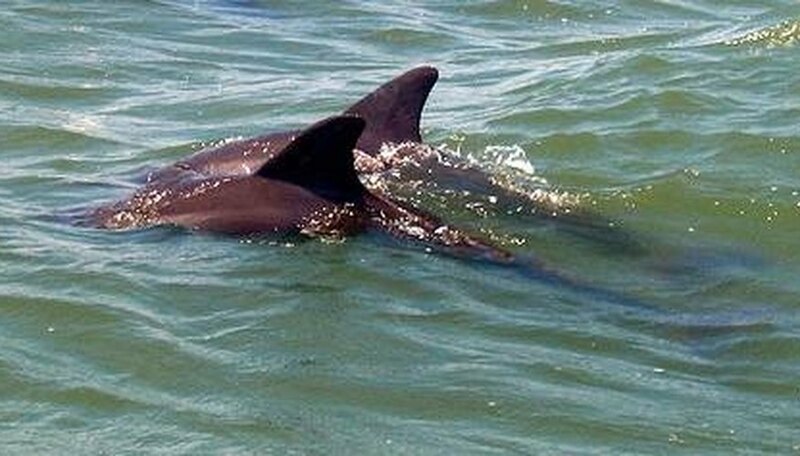 Dolphins studied along the coast of the United Kingdom were found spending winters in southern Cornwall and moving north along the coast in warmer weather. Scientists could find no specific pattern to this behavior--some dolphins would travel long distances between the areas intermittently. In certain areas, such as along the Pacific coast of Japan and the North Carolina coast, dolphins follow the seasonal movement of their prey. This is not typical of most dolphins, however; most dolphin migration has been found to correlate much more to water temperature than to seasonal migration of their food. Some coastal dolphins have year-round home territories, as well as ranges of seasonal movement, and scientists have not yet determine whether their migratory patterns are actually in an extended home range. It has been difficult for scientists to study this behavior, because many dolphins' home ranges overlap with those of others and change often. Sometimes a group of dolphins will stay in the same home range for decades, and other times the range will change over a few years or less. Moore, Shelley. "Do Dolphins Migrate or Hibernate?" Sciencing, https://sciencing.com/do-dolphins-migrate-hibernate-4588314.html. 24 April 2017.